Temperatures are quickly rising and that can only mean one thing; summer is almost here! As the days grow longer and the heat begins to soar, electricity bills can creep up too, if you’re not careful. On average, a summer electricity bill can increase as much as 12 percent over other seasons. The U.S. Department of Energy estimates as much as half a home’s energy is spent heating and cooling it, but there are ways you can keep your bills from going through the roof. Change direction! A simple change in the direction of your ceiling fan can make a big difference. Make sure the air from the fan is running in a counter clockwise direction, so the air is blowing straight down for the breezy, cool feeling everyone loves. Ceiling fans use fewer kilowatts than the HVAC system. This allows you to run the AC at a higher temperature, also saving energy. Air it out. Long days of fun in the sun means there’s no shortage of laundry during the summer. The sun is a great natural clothes dryer, so get that crisp, fresh outdoor scent without using those chemical-infused dryer sheets. Take it outside. The outdoor grill isn’t just for entertaining or parties. Instead of raising the indoor temperature by using your oven and stove all the time, fire up the barbecue! Any day of the week can be the right day to discover new recipes perfect for an open flame. Open up! Many people take time during the summer to finally start on the remodeling project they’ve been putting off all winter. If you’re updating your home this summer, energy-saving and solar choices benefit your future in a big way. Energy-efficient windows and solar paneling can both affect the temperature in your home. Check out goambit.com/solar for more information. 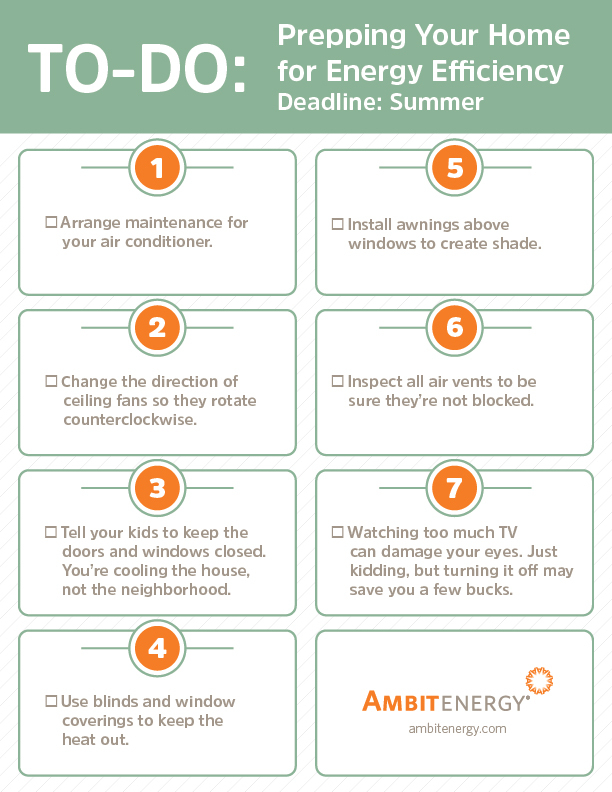 With these tips in mind, you’re ready to take on the summer and beat the heat!